So I’ve been very busy, but more so LAZY to blog. I am not claiming to be a writer but you’ve just got to be motivated (frankly, in the mood) to do it. Miel, although it was this blog that inspired you to collect and now, it’s you that’s inspired this blog! If people really pay attention, half of the pictures are from Miel!! You are a perfectionist and I love you for that. What is more appealing is your generosity and how you think of me. The mugs says it all!! You’ve completely spoiled me, with mugs yes, but definitely with your friendship more so than anything. I’ve always been a UK fan since I was little but really, UK is blessed to have you, almost as much as I am having known you for the past year or so. If people were to listen in on our conversations, they may have mistaken 1 yr to be maybe TEN years?? I adored the many mugs you’ve sent, but more so than the mug is the little BFF doll! I bet if you were living in the WashingtonDC area, we would do many meetups and talk about many things in life. The conversation would be endless and so many laughters. My jaw and stomach muscles would get a great workout. I finally got to hear your voice, thanks to SKYPE. Our first conversation went on for merely 5 hrs. What could we possibly talk about? Ah, that is something only BFFs would know!! This long distance relationship is making me anxious. I’ve never had a long distance relationship that feels so much like home. It’s Lent, my favorite time as a Catholic. I just became and auntie again and will be one again in 2 more weeks. I am so blessed in so many ways. Heaven is on earth when you are surrounded by such wonderful friends and family. Until our next Skype..xoxo mug sistah! When I answered the door and saw it was the delivery man with a big, heavy box addressed to you, I was thinking what in the world did you order as it’s normally some lightweight stylish clothing accessory or something for the ever increasing nieces/nephews. Usually I’ll see a package with a mug or two, but this one takes the top prize! I feel that you have just been given the end results of a Starbucks mug purchasing Eurail adventure! One day we will have to make the trip across the Atlantic to visit. Thank goodness for Skype for now. Treasure it! treasure the moment! Thank you for your comment Jo! I am not sure whether you believe in Cause and Effect? You may have planted a good seed in your previous life and now received a good karma. 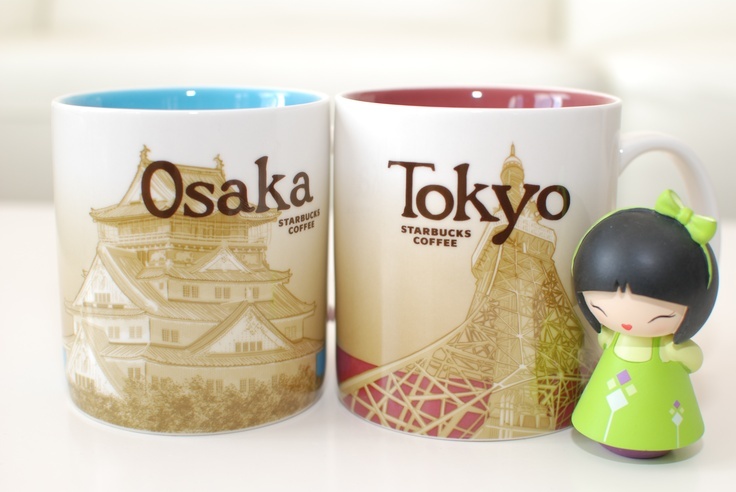 I am currently in Japan and I am desperately looping for these mugs! Do you know where I can find them please? Only sold at Yokosuka Naval Base in Kanagawa Japan. Hello! Do you know where I could find one of these?! They are discontinued. You can try your luck on Ebay or Amazon..